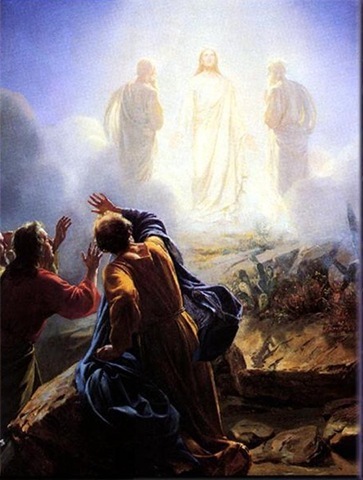 Tomorrow, August 6, is the Solemnity of the Transfiguration of Our Lord. Jesus took Peter, James and John up to Mount Tabor. He showed them his glory, becoming bright in splendor. He wanted them to recall this episode when He would be arrested and would undergo the Passion. Just as the three Apostles saw the glory of Jesus on the mountain, we are reminded of the same. In each and every Mass, we are present at the Cross of Our Lord. That is why it is called the Holy Sacrifice of the Mass. Yet, this Victim and Priest is God. We see that God humbled Himself to the extreme for our salvation. It is God on the Cross; it is God offering Himself for us in each Holy Mass; it is God Whom we can receive on our tongues. Jesus always teaches us two great lessons: that of humility and that of love. The glorious Son of God shows us the humility of God. By becoming Man, He reveals through his life, death and resurrection what we should be. He embodies what it means to be in the image and likeness of God. We are meant to be humble simply because God is humble. Pride is a persistent sin in everyone’s life. It tempts us to want to be first, to be on top. It causes people to lose their tempers, to seek revenge, to be judgmental and prejudiced among other things. Our Lord exemplifies humility. He did not seek revenge on those who opposed and hurt Him. He didn’t even complain about them. We know that He forgave them. Love is the greatest of the virtues. It is unconditional and places no burdens upon the loved one. It does not look for something in return. As St. Paul relates the inspired word of God, love is not jealous or boastful. It is selfless. Jesus in his Transfiguration showed his awesome majesty. It was not meant to command fearful obedience. It was meant to bring encouragement to the Apostles when they would see Him suffer and die on the Cross. It encourages us as well. God, the almighty, is humble and loves us unconditionally. We want to do the same. This is the only way that we can be what God intended his children to be. This is the only way for true happiness in this life and in the next.